Applies a shaking motion to the source clip over time with translation, zooming, and/or rotation. The shaking is random but repeatable, so with the same parameters the same shaking motion is generated each time. Turn on Motion Blur and adjust the Mo Blur Length for different amounts of blur. Adjust the Amplitude and Frequency for different shaking speeds and amounts. The Rand parameters give detailed control of the random non-periodic shaking, and the Wave parameters adjust the regular periodic shaking. The X, Y, Z, and Tilt parameters control the horizontal, vertical, zoom, and rotation amounts of shaking respectively. Source: The current track. The clip to shake. Style: Popup menu, Default: Normal . Controls the type of shaking. Normal: A steady camera shake. Twitchy: Periods of stillness interrupted by bursts of rapid shaking. Jumpy: Sudden jumps from one place to another, with slower drifting in between. Scales the amplitude of the shaking motion. Frequency: Default: 8, Range: 0 or greater. Phase: Default: 0, Range: any. Stillness: Default: 0.7, Range: 0 to 1. In Twitchy mode, adjusts the fraction of the time that the image is still. Increase for more frequent shaking. Twitch Frequency: Default: 2, Range: 0 or greater. In Twitchy mode, controls the length of the periods of movement and stillness. Increase for shorter, more frequent bursts of movement. Drift: Default: 0.3, Range: 0 to 1. In Jumpy mode, controls the speed of movement in between jumps. Center Bias: Default: 0, Range: 0 or greater. In Jumpy mode, adjusts the likelihood that each jump will reset the image to its original position. If set to zero, every jump is random. If set to one, every jump will go back to the center. Seed: Default: 0, Range: 0 or greater. Motion Blur Length: Default: 1, Range: 0 or greater. Scales the amount of motion blur. Use around .5 when processing on fields or 1.0 for frames to give realistic motion blur. This parameter has no effect if Motion Blur is No . Motion Blur: Popup menu, Default: No . 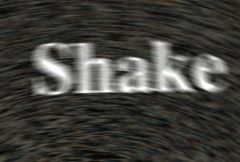 Options for motion blur of the shaking motion. Yes Quick: motion blurs the result in the direction of the shaking motions, with a faster but lower quality motion blur. Yes: motion blurs the result using a higher quality motion blur. X Rand Amp: Default: 0.2, Range: 0 or greater. Amplitude of horizontal random shaking. X Rand Freq: Default: 1, Range: 0 or greater. Frequency of horizontal random shaking. X Wave Amp: Default: 0, Range: 0 or greater. Amplitude of horizontal regular wave shaking. X Wave Freq: Default: 2.5, Range: 0 or greater. Frequency of horizontal regular wave shaking, in cycles per second. X Phase: Default: 0, Range: any. Time shift of the horizontal shaking. Y Rand Amp: Default: 0.1, Range: 0 or greater. Amplitude of the vertical random shaking. Y Rand Freq: Default: 1, Range: 0 or greater. Frequency of the vertical random shaking. Y Wave Amp: Default: 0, Range: 0 or greater. Amplitude of the vertical regular wave shaking. Y Wave Freq: Default: 3, Range: 0 or greater. Frequency of the vertical regular wave shaking, in cycles per second. Y Phase: Default: 0, Range: any. Time shift of the vertical shaking. Z Rand Amp: Default: 0, Range: 0 or greater. Amplitude of the zoom random shaking. Z Rand Freq: Default: 1, Range: 0 or greater. Frequency of the zoom random shaking. Z Wave Amp: Default: 0, Range: 0 or greater. Amplitude of the zoom regular wave shaking. Z Wave Freq: Default: 3.5, Range: 0 or greater. Frequency of the zoom regular wave shaking, in cycles per second. Z Phase: Default: 0, Range: any. Time shift of the zoom shaking. Tilt Rand Amp: Default: 5, Range: 0 or greater. Amplitude of the rotational random shaking, in degrees. Tilt Rand Freq: Default: 1, Range: 0 or greater. Frequency of the rotational random shaking. Tilt Wave Amp: Default: 0, Range: 0 or greater. Amplitude of the rotational regular wave shaking, in degrees. Tilt Wave Freq: Default: 2, Range: 0 or greater. Frequency of the rotational regular wave shaking, in cycles per second. Tilt Phase: Default: 0, Range: any. Time shift of the rotational shaking. Red Amplitude: Default: 1, Range: 0 or greater. The relative amount of shaking in the red channel. Changing this value from the default will cause the red channel to move more or less than the other color channels, resulting in a color fringing or channel separation look. Green Amplitude: Default: 1, Range: 0 or greater. The relative amount of shaking in the green channel. Blue Amplitude: Default: 1, Range: 0 or greater. The relative amount of shaking in the blue channel. Red Phase: Default: 0, Range: any. The relative phase of the red channel. Positive values will move the red channel ahead of the others in time, causing it to move first and the other channels to follow. Negative values have the opposite effect, causing the red channel to lag behind the others. Small values usually produce the best looks. Green Phase: Default: 0, Range: any. The relative phase of the green channel. Blue Phase: Default: 0, Range: any. The relative phase of the blue channel. RGB Randomness: Default: 0, Range: 0 or greater. The amount of random motion in each color channel. Turn up this parameter to cause all three color channels to move randomly on different paths, independent of the overall shaking. This motion is scaled by X Rand Amp, Y Rand Amp, Z Rand Amp, and Tilt Rand Amp. RGB Frequency: Default: 2, Range: 0 or greater. The frequency of the random color channel shaking.